Cameroonian architecture firm Hermann Kamte & Associates just plans for a stunning wooden skyscraper inspired by Africa’s iconic Baobab trees. The Native Skyscraper is a twisting tower built with natural and locally-sourced materials that shows how biomimicry can make the future of urban design more sustainable. According to the architects, the tower design is a smart building concept for the future; a solution for cities looking to address massive urban growth while simultaneously trying to reduce their ecological footprints. The green building materials and sustainable features would make the tower design a “marketable, serviceable, economical sustainable, environmental, ecological and social” option for the urban designs of tomorrow. The interior of the tower is also heavily influenced by nature. The wooden beams and columns will be left exposed, providing a treehouse-like appearance for the common areas. An abundance of greenery, including a series of living green walls will also fuse the man-made tower with its natural surroundings as well as create a pleasant microclimate throughout the interior. 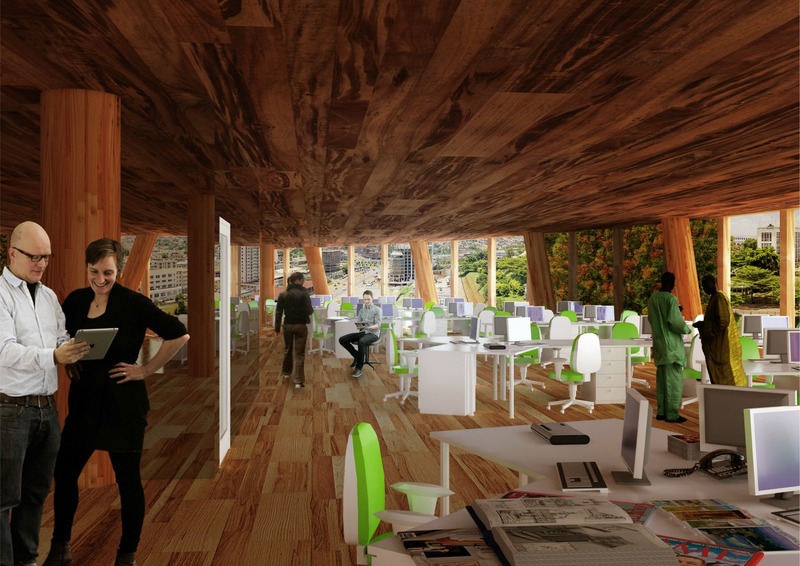 Cameroonian architecture firm, Hermann Kamte & Associates, has just unveiled a proposal for a stunning, green-infused wooden skyscraper inspired by the iconic African Baobab trees. 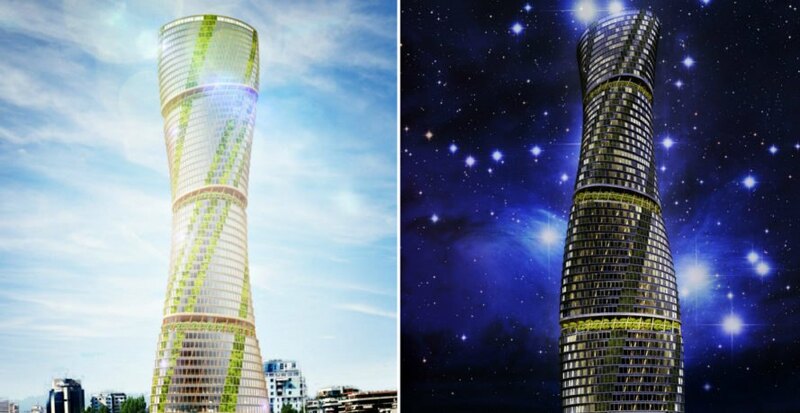 The twisted Native Skyscraper design envisions a smart tower that will be built with natural and locally-sourced materials that will serve as an example of how future urban design can be sustainable through the use of biomimicry architecture. According to the architects, the tower design is a smart building concept for the future; a solution for cities looking to address massive urban growth while simultaneously trying to reduce the population's ecological footprints. The green building materials and sustainable features would make the tower design a "marketable, serviceable, economical sustainable, environmental, ecological and social" solution for the future of urban design. The wooden tower would be soaring tower that twists as it rises. Columns of greenery are infused throughout the wood and glass exterior. 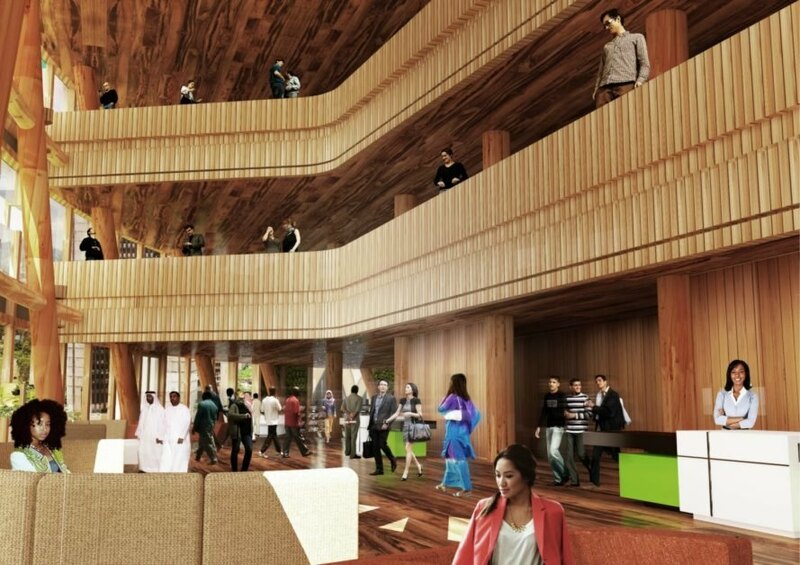 The design team also chose wood as the primary building material not only for its green properties, but also for the ability to connect the tower to its surroundings. The interior of the tower is also heavily influenced by nature. The wooden frame and ceilings will be left exposed, providing a treehouse-like appearance for the common areas. .
Cameroonian architecture firm Hermann Kamte & Associates just plans for a stunning wooden skyscraper inspired by Africa's iconic Baobab trees. The Native Skyscraper is a twisting tower built with natural and locally-sourced materials that shows how biomimicry can make the future of urban design more sustainable.